I don’t mean that you suddenly feel the need to compare Halo stats (is that still a thing?) or laugh at farts. What I mean is that you don’t trust your Writing Voice. You don’t sit down at the notebook (or keyboard) & feel like it’s going to show up for you every single time you need it. It could crack & creak unexpectedly & embarrass you. Or worse? Everyone might realize that you don’t know what you’re talking about. You don’t even know what to say or how to cross the gymnasium floor to say it (remember the sock-hop-dead-zone?). You know that even though your Mum always tells you to just be yourself, nobody else really gets it. You just can’t Trust Your Voice. And me telling you every week to, “Trust, trust, TRUST YOUR VOICE!” isn’t really helping. It’s easy for me to say, right? But what are you supposed to do if you just don’t have that feeling. It’s a growing thing, your Writing Voice, & you need to be in charge of that growth in order to really feel like you are the one in charge of how your Voice comes out – & how you feel about the process too. Just like puberty, this process can be scary & confusing for those of us trudging through it. Luckily, we’ve already dealt with the former (I’m doing it from the Mum side now, & I thank goodness every day that I’m not a teenager anymore), & we’ve learned that we can survive the growth process, right? We know that there will be awkward moments, but only through those moments will we learn the things we need to know in order to get out of that awkward ugly-duckling phase & become our lovely swan-writer-selves. Plus? You’ve got Me! And I have some specific things for you to do that’ll get you there faster & with less sweaty-armpits & awkward dance-moves. 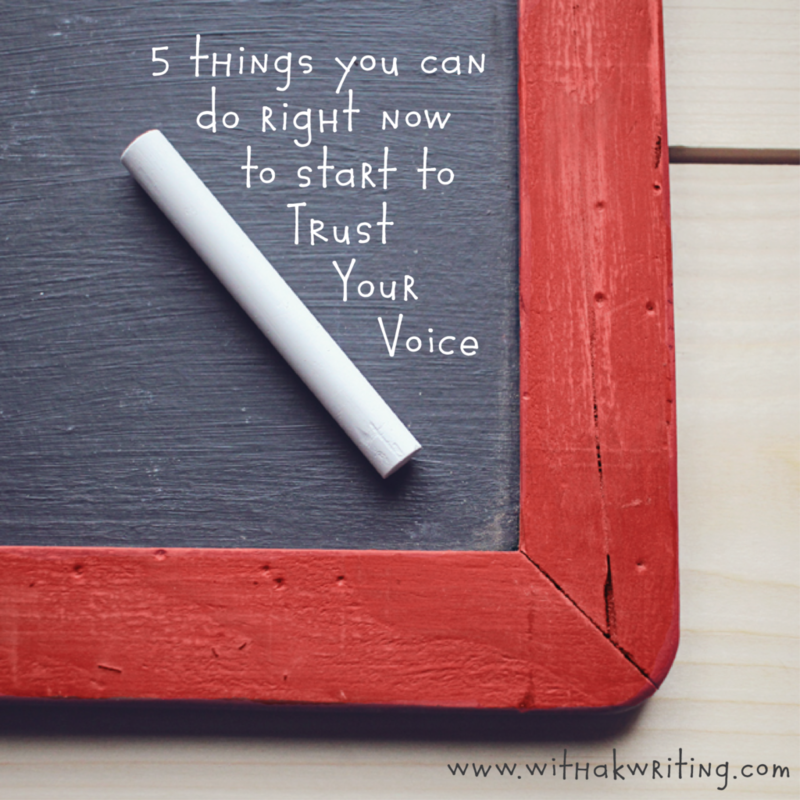 If you’re not totally trusting your own Writing Voice yet, try these 5 things – on purpose – & watch how your feelings about writing & yourself change. It’s pretty freaking amazing. Start doing these 5 things now, & Trust Your Voice more every day. 1 ~ Pay attention to the world around you! This one is huge for me. In fact, it’s how I first realized that you can truly learn to be a writer. In one of my University writing classes, we had to write a paragraph every week, using a different writing technique. That got me in the habit of looking around me for quick & straight forward things to write about. You see, a paragraph doesn’t leave you much space to explore a big idea, so the details matter. My friends & I started to develop a bit of an inside-joke about it. Whenever we noticed something interesting enough to make the cut, “There’s a paragraph!” or, “Write a paragraph” was our short-hand to point out that an interesting idea lived there. We were training ourselves to notice the small things & explore them in our heads, even when we weren’t actively looking for something to write about. One day, months after the class was over & done with, I found myself standing on a bridge near my grandmother’s farm in rural Nova Scotia, narrating a description of the family home & the river behind it in my head. 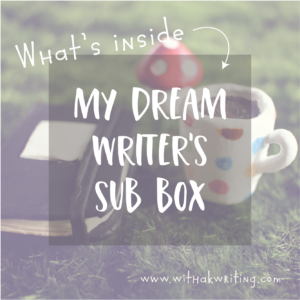 I realized that day that I was a writer, because I was – without even meaning to be – paying attention to details & thinking about how to describe & communicate them. 2 ~ Exercise your creativity by looking for problems to solve. This one’s huge! Creativity isn’t magical; it’s not a unicorn or a fairy or a muse that will fly away from you if you don’t appease her whims. It’s got a purpose! Creativity allows us to explore new ideas in order to solve a problem. It’s how we figured out fire, the wheel & über. It’s also how we started forging our mothers’ signatures to get out of gym class. No? Me neither. 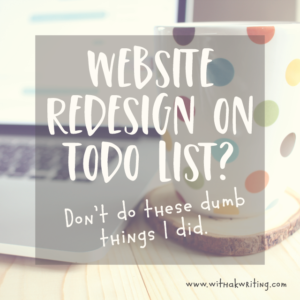 The key thing is that we use our creativity best when we are solving problems…not when we are relaxing with a mimosa in a perfect little cabin in the woods. 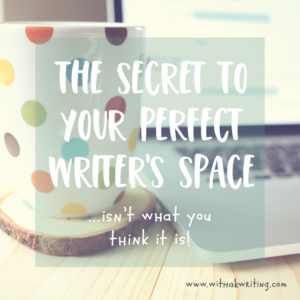 If you’re staring at a white blank page & your Writing Voice is coming out as a bored little croak, build some parameters around yourself: some boundaries that will make a challenge for your brain. 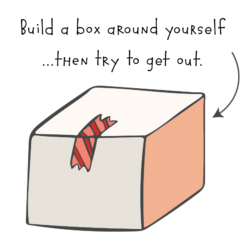 I often say to my students, “Put yourself into a small box, so that your creativity will work harder to get out of it.” You’ll be surprised at how many more ideas come. This is why writing prompts help us so much. They give our mind a starting point & some boundaries, so that our creativity can immediately start to plan an escape from them. So get yourself some writing prompts (like the #30DaysWithaK free-writing challenge) to give your writing voice some boundaries to bust, & whenever your creative muscles feel a little weak, exercise them by looking for problems to solve all around you. 3 ~ Embrace & inform your expertise. 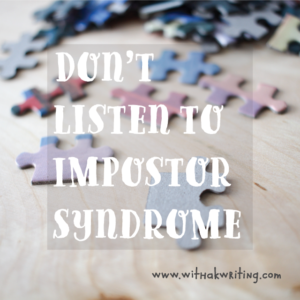 Have you heard of impostor syndrome? Yeah, me too. It’s a real thing & it’s killing a lot of our impulse to share our voices. We are afraid that if we share our writing voice with the world, they will all realize that we’re a big faker-pants McGee & have no right to speak what-so-ever. Well that’s clearly wrong. We all have the right to share our message, & we have expertise in the area if we have a business or blog about it, right? The first step in dealing with this particular voice-gremlin is to embrace the expertise we have already. It’s not always easy, but it’s important. Stop comparing yourself to the absolute TOP people in your world, & start noticing how much you have to offer to those with less knowledge than you have. But the next step may be the most important: we need to keep informing it. 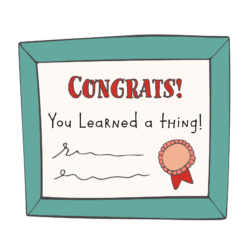 You can’t just shout, “I am an expert, mutha-chugga! Hear me ROAR!” & expect for that to stay true forever. 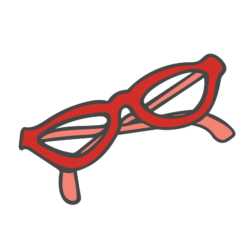 Take classes, sign up for newsletters, magazines & journals, join a peer group or delve into your own research with a singleminded purpose to learn more & inform your expertise further. It’s amazing how education & exploration will bolster your confidence in your own Voice, so make a plan & decide what you will focus on learning for the next month or two. 4 ~ Be of service to others. This is a mindset shift (& I don’t use that term…like EVER! so you can trust that I mean it this time) that’ll change a lot of the things that make you crazy about writing. Believe me. One thing I know for sure about writing is that the little writers’ block devil who sits on your shoulder & tells you to be quiet has one big, shiny weapon that he uses more than any other: your pride. The greatest antidote to that poison is to shift toward using your Voice to serve & help others, without thinking about what it will make you sound like. When you nail this, your self-destructive, overly judgemental inner dialogue will just stop. 5 ~ Practice! Even when you don’t want to. Sorry, kitten. There is no shortcut to being great at anything. You’re going to have to do the work, in order to become a strong & confident writer. 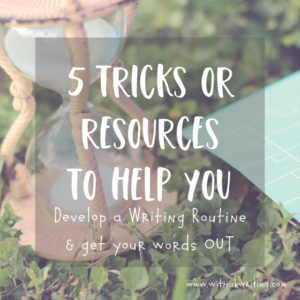 I’ve said it before, & I’ll say it again: you need to put in the hours & practice writing every day. That’s the only way to find your own style & develop it. It’s the only way to find & target your weak spots & turn them into strengths, & it’s the only way to get comfortable putting one word in front of the other – again & again & again – until you find your voice. 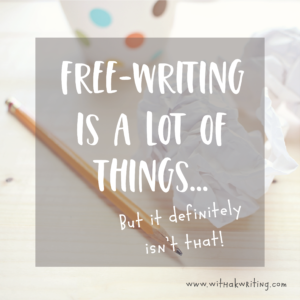 That’s why I created the #30DaysWithaK free-writing challenge. You can sign up for free & receive a prompt from me every day for the next 30 days that are specifically designed to take you through the process of shaking the cobwebs & pulling the scary writing-fear monsters out from under your bed to look them in the eye & tell them to get out of your way. 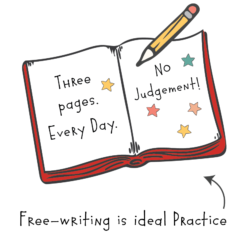 It’s designed to get you to the notebook every day to develop a habit that’s both consistent & fun, so that this practice element of your Voice-Trusting journey can be less about slugging through painfully & more about discovering that you actually enjoy writing. Imagine! Spoiler though: donuts & lattés help with that part. If you’ve already taken the challenge, don’t feel left out. Starting in June, I’ll be sending a set of brand new writing prompts every single month to all past challengers, so that you can keep your free-writing practice going strong too. So join the community & the conversation, kitten! Tell us in the comments which of these 5 things you are going to add to your life now. I am not able to sign up for the challenge. A new challenge is being created AS WE SPEAK! 🙂 I will send out notice as soon as it’s ready. Thank you for this very helpful post. I would love to write well and write good copies that sells my photography business. Number 1 hits the spot for me – an idea to know where to begin and 2, 3, 4 and 5 needs a lot of work on my part. I need to work on weeding out the gremlins in my mindset. I will definitely sign up for your 30 day challenge. You are so welcome, Ruby! Those gremlins are major jerks, but you can chip away at them with a purposeful practice 🙂 Keep it up! I love to hear that, Gretchen! Paying attention to those sensory details around you & letting your mind search for the right words to describe them is a great practice for writers to do. I’m glad that it’s a natural tendency for you; that will mean a lot as you play with your new inspiration. Yeah! Embracing your own expertise is a tough thing to do, right?